The name “Lucy Billings” is finally out of the box. With her third CD – now #6 on the Folk Music Airplay Charts – Billings has created a major album...stunning in its lyrics....with equally beautiful melodies, vocals, instrumentation and production. Produced once again by the acclaimed multi-instrumentalist, John Jennings (who co-wrote two of the songs), Carry the Water is a thoughtful album, deep as a well, with songs that are simultaneously intimate and universal. And Lucy delivers these songs in a voice that is strong and warm, fluid and resonant, taking flight effortlessly in higher registers while never losing that clear, inviting, come-on-in tone. 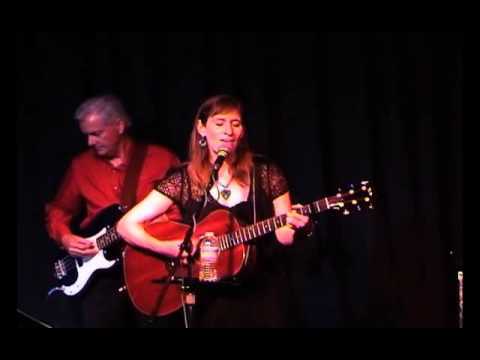 Billings’ rhythm guitar is solid, as Jennings weaves through her interesting chord progressions with a cool bluesy/jazzy piano and keyboards...various stringed instruments...and additional drums and percussion. With excitingly spare, sophisticated arrangements – allowing you to appreciate every nuanced note and word – the songs are primarily performed by just Billings and Jennings, including backing vocals by each of them. Enhancing this authentic sound is Harry Stinson on drums, Vince Santoro on percussion, and James T. Brown on acoustic and electric bass. From the outset, the whole album has a cool folksy/bluesy groove to it. But what really sets Carry the Water apart for me are the lyrics, and the bold, timeless themes of the songs. In addition to Billings’ trademark “story songs,” and songs of social consciousness, this album is characterized by an uncommon candor and introspection. It is the personal honesty of these songs that makes them so easily relatable. It takes a lot of courage to be vulnerable. And it takes a lot of strength to face your fears. But Lucy Billings has done both in Carry the Water. She is one of the strongest, bravest people you will ever have the pleasure of getting to know as you listen. A prayer like a river that crosses their lips. Carry the water, carry it home. Carry the Water is structurally unique in that it doesn’t use any rhymes. It doesn’t need to. The lyrics flow naturally, with powerful images that carry you along. And of course, these images have larger implications. When Billings says, “Carry the water, it’s more than water, it’s more like life,” it is a powerful reminder of the vital need for water all over the world—as we cope with severe drought in many parts of our own country. God’s House is another stand-out track – a story-song about a couple who buy a church and turn it into their home. This song manages to capture something of a humorous tone and combine it with some interesting, “higher” thoughts on lasting religious connections. Billings is a master of metaphor and this is brilliantly demonstrated in Canyon, turning her childhood memory of a wide, twisting canyon into a psychological symbol of internal struggle – bridging the gap between whatever is holding her back and what she desires to become. There are many songs in this album that probe the depths of Billings’ fears, longings, and uncertainties. Songs like The Answer, The Edge of the Ring, Courage, and Freedom, give voice to feelings that we all have, but rarely admit to. Freedom deals with leaving a job that you hate. What You Gonna Do? deals with the identity crisis that often follows retirement. The Here and Now involves the final days of life with a loved one. And Not Far From Me is about finding comfort in a parent’s love even after they have passed on. How so many wrongs could be part of your plan. Yet she manages to ask this age-old question (like a modern-day Book of Job) without anger or rancor...just a lasting, heartfelt question. And in the last song, State of Blind, she calls our attention to the “looking away” we all are guilty of when faced with life’s inequities – be it the homeless veteran on the corner, the immoral war raging somewhere, or our own imminent problems. In short, this is an album that makes you think…and feel. Yet, at the same time, it simply provides some beautiful listening.